Home > COMET INDUSTRIES BELTS > Comet 300666 (A-C) Drive Belt. Comet Industries 300666-704126 BELT. > Comet 300661 Go Kart, Golf Cart, and ATV Belt. > Comet 300315A SPRING FOR 858 Series TORQUE CONVERTER - "NATURAL" COMET 858 DRIVEN Clutch. 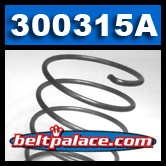 Comet 300315A Spring for Comet 858 Series Driven Clutch. 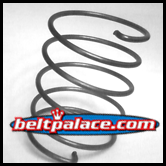 Replaces bent or broken springs from Driven Clutch for Comet 858 Torque Converter Systems. "Natural" refers to the Comet Industries system of color coding their tension springs as the 300315-A has no paint color used to cover the bare metal clutch spring. Comet 302604C cam spring. Comet 770 Series. COMET 300620, Comet Industries belt replacement for 500 Series, 704038 Go Kart belt. The Comet 300620 Go Kart Belt is an exact replacement for Comet Industries belt 704038. Replaces OEM Comet 500 Series torque converter belt. Measurements: 0.92 Inch Width, 32.29 Inch Length. Symmetric Cogged belt. A popular size ATV belt, Go Cart belt, Golf Cart drive belt, People Mover clutch belt, and Mini-Bike drive belt. The Comet 300621 Go Kart Belt is an exact replacement for Comet Industries belt 704039. Replaces OEM Comet 500/858 Series torque converter belt. Measurements: 0.92 Inch Width, 33.24 Inch Length. Symmetric Cogged belt. A popular size ATV belt, Go Cart belt, Golf Cart drive belt, People Mover clutch belt, and Mini-Bike drive belt. The Comet 300622 Go Kart Belt is an exact replacement for Comet Industries belt 704040. Replaces OEM Comet 500/858 Series torque converter belt. Measurements: 0.92 Inch Width, 35.16 Inch Length. Symmetric Cogged belt. A popular size ATV belt, Go Cart belt, Golf Cart drive belt, People Mover clutch belt, and Mini-Bike drive belt.